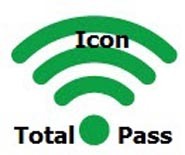 Upgrade your Icon TotalPass to WiFi with this user-installable chip and simple program update. Technical Support included. Why buy from EmployeeTimeClocks.com? We have the technical skills you need. We can walk you through the steps to do this. We are a hands-on, technical support company. You only need this if you want to upgrade to (add) WiFi on your TotalPass. Install this WiFi upgrade part in to your Icon TotalPass time clock and you will then have a WiFi clock! It does not lose its USB or wired network capability. Icon has really thought this one through. You enter your network password via simple steps at the keypad, including capital and lower case letters, numbers and symbols. You also get to call Icon for assistance setting it up.